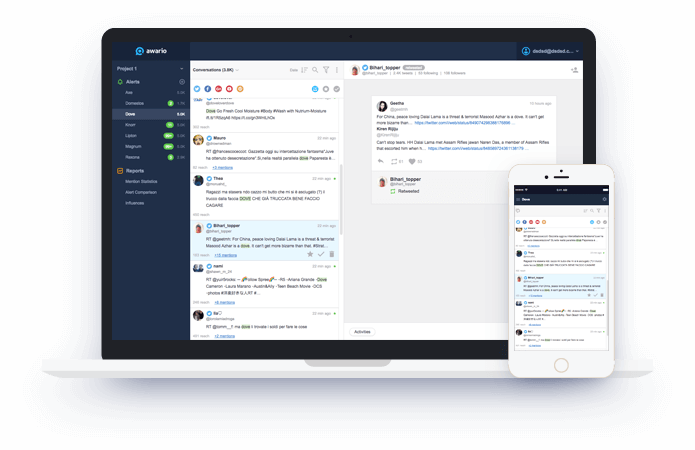 Awario helps you monitor important discussions across social media and the Web. Looking to spread the word about your product or service? Engage with customers and build brand loyalty by always being there when they need you? Interested in finding sales opportunities online? Would like to track how the word-of-mouth about your competitors is spreading? How about building relationships with influencers to market your products to (and through) them? Awario will help you with each of those tasks. Pros: Awario's potential is immense. The key thing it does for us is give us a perspective on the social media conversations that matter for our business - a selection of valuable, actionable posts. For every brand/product you have, make sure to create 3 separate alerts: 1) your actual brand name to see what people are saying about you and get notified when influencers or big publications mention you 2) your main competitor to see which tactics they're using and where they're featured 3) your industry terms to find people interested in your product and engage with them (best to do this with Boolean search). The insights we got with this setup have been invaluable. Here're a few benefits we've seen in under a month of usage: 1) Understanding the language people use when speaking about our product to incorporate it in our website copy 2) Finding actual (hot!) leads within minutes 3) Figuring out high-impact publications that mention our competitors - great possibilities for partnerships there 4) Finding local forums where people are talking about us and stepping into the discussion 5) Same as #4 but for competitors - and joining the conversation as well with our offering. If you're in a competitive niche and are looking for places to bring you traffic/awareness/leads, you can't afford to miss this tool. Awario will pay off for itself within a few hours. Cons: Setting up searches can be a bit tricky from the start if you want to make them super precise. Spend some time reading their docs on Boolean search and you will be good. Or even get in touch with their support and try and explain what you're looking to do - they'll give you a hand with the setup. Pros: I love how I can set Awario to look for the things that I'm after, and then leave it. The automation on this product is great because I can set email alerts for the specific key words that have been used in my favourite social media platforms and then spend 2 minutes each day reviewing them on email. This saves me a ton of time and allows me to focus on the areas of my business that matter. I love how I can have numerous alerts set up and change and track them. I love how I can eliminate the chatter from the social media platforms that I don't enjoy and get rid of them. Cons: To really get it working for me, I need to spend some time learning how to use the interface optimally. I don't always have time to do this. Overall: Overall, I'm really enjoying Awario. It finds the keywords that i'm looking for without me having to break a sweat. I love that the blog is useful and teaches us how to use the interface to greater and greater effect each week. Pros: Awario is a great tool to discover who is talking about your brand, whether it's positive or negative with the sentiment indicator. By using this tool you are getting a great bird's eye view over your brand's public perception, as well as that of your competitors. I set up an alert for my brand, together with the product's keyword and some competitors. This allows me to see the development of the niche I'm operating in over the course of time. I can get daily reports to see what topics the community is talking about and who is most present. Especially useful is the influencers tab where you can find new influencers for a potential cooperation. The dashboards are also super useful to see everything that's going on regarding the keywords you are tracking. There is also a well done learning center with guides to help you set up your tracking for maximum results. Cons: It seems to be mostly targeted towards English speaking countries as there is no way to filter by language in the mentions statistics/influencer section. I'm mostly interested in brand mentions in the European market, but get flooded with US mentions that are not as relevant to me. It would be great if I could restrict mentions to specific countries. The price tag is quite hefty and is probably not suitable for smaller businesses. Data export which is absolutely essential in my opinion comes with a handsome amount of money, so you really have to think if that's a good investment in your company. The top influencer in my niche is Instagram. I guess there are some quirks to weed out still. Apart from that, awario is a solid solution for anybody interested in monitoring their brand reach/perception or how well your specific niche is represented on social media channels. Pros: Not only can you monitor your brand and specific search terms across the web but they also have a lead generation tool to help you land customers who are talking about specific topics using their lead monitoring tool. It is also laid out in a very user friendly dashboard that makes it easy to understand. Cons: Your first searches may not bring back the results you want. You really need to learn how to use the search tool and boolean searches to get what you need, so there is a learning curve on how to use the tool. Overall: Very good, use it every day to monitor our brand as well as dozens of specific seacrhes across the web. Pros: Tracking key words or what people are talking about being greatly used in our company. We set up an alert and then when we find a person asking about services we provide, we can message them directly and connect. Cons: Some time the program moves slow, I am not sure if this is my internet connection or that it is they are getting a lot of requests. However, after this is set up, we just log in once a day and check, so it's not a big deal. Overall: it increased our awareness of what people are talking about on the net without us having to do searches each day. Excellent for monitoring of brands, people, and news. I would highly recommend this SAAS to anyone. Pros: It is easy to setup and gives you very fast information on any easy to read dashboard but the best part is that is that you can generate leads by responding to comments online at an amazing speed. Cons: I wish there were easy ways to narrow your search but I haven't been able to set my keyword parameters so that I filter out alot of stuff that isnt relevant but I suspect this is what they are working on now because its algorith has been getting slowly better. Overall: social media and web monitoring of brands, competition, and personal mentions. Pros: We had paid literally 7 times the amount we paid for this. Overall, the results it returns are on par with those of the more expensive one. Cons: Not sure, as it does what we need. Perhaps we will uncover a few weaknesses down the road but for now, it works great. Overall: We are able to see mentions of our brands all over the web. There's no way to properly do it manually, so this not only saves us time, but we get a much better overview of what is being said about our brands. Pros: Above all, I love the fact that Awario tracks web mentions in addition to social. Most similar tools will only give you social data (often at a higher price). I love the technology behind this tool - I know building a search engine is no easy task. Awario's being developed by a young team, they're very responsive and improving the product quickly. I've seen feature ideas of my own (white label reports) added within a month, at no extra cost. It's still a relatively new product that's only starting to gain the word of mouth, and I'm excited to be among the early adopters. In a year from now, I think Awario will be part of every online entrepreneur's toolkit (and probably worth 10x its current price). 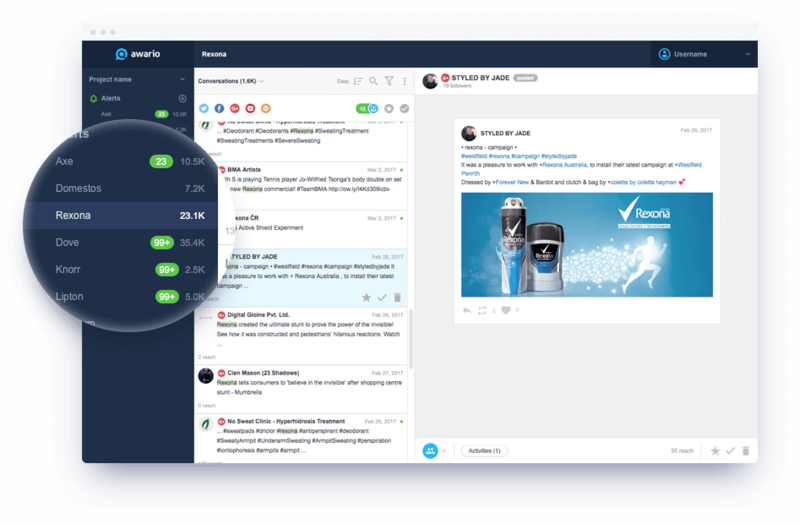 Overall, this tool is for you if you're looking to monitor mentions of anything online and across social: your brand, competitors, trends, etc. Cons: I think the way Reach is calculated for web mentions could be improved. Also, I wish the team could add LinkedIn tracking. Overall: Finding people interested in my service, and discovering good platforms to promote my business by monitoring competitors. Pros: I started using Awario because of its price - it's much cheaper than similar products on the market. I soon realized it's also not worse than Mention, brand24, etc. It has all features necessary for monitoring and it also keeps improving what seems like every week. All in all, I love the product, and can't wait to see what other features these guys will come up with. Cons: It can be a bit tricky to set up an alert at first: you have to specify the language, location etc before creating an alert - otherwise it will look for everything. You can edit the alert later, but some of your limit will be used up by this point. Overall: I found new lead opportunities, prevented a potential social media crises, and kept an eye on what the customers say abound the company that I work for. Pros: Easy to use application which provides more data than other tools. It helps me to promote my own company and saves much time. Nice statistics for SMM research. Plus I can mange social activities from Awario directly. Cons: No option to manage users, as I would like to share some work with my assistance. But I heard they already work on it. Overall: It help me daily to promote my company in socials. Pros: What I like most of all is that every morning Awario send me an email with a list of all kind of influenecers mentioning our brand, and a list of all websites who mentioned our brand or linked to us. This gives so many insights on what to do, helps to find all kinds of bottlenecks and (the most important for me) helps to react timely. A real day-saver for me! Cons: They're that good that I cannot name any cons actually ) Plus they've got a really great support team/account managers. 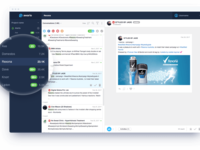 Pros: Awario monitors mentions of your company/products on social media. All the mentions are coming into one handy dashboard and it is up to you to either turn them into leads or fix any negative sentiment about your business. Cons: Not much to complain about. The sentiment indicator is not 100% accurate. Cons: Almost none. At the beginning here was just the feeling/question if I have everything set up correctly. But a quick email to support solved this - they confirmed that everything was OK + added a small suggestion, that tweaked the search results. Cons: Awario does not support LinkedIn, though as I know it is a common problem for most of SMM tools. Hope they will implement it in the nearest future. Overall: Awario helps me to get valuable data and I don't need to spend hours filtering received information. And as we all know - time is money. Cons: At present, it has a limited social media like twitter and youtube but I believe it will eventually add many other social media apps. Overall: This can also be used as a tool to identify the influencers in your niche and also have Boolean search which is a great option in awario to neglect unwanted mentions. Pros: Lots of sources, very granular mention checking with advanced filters and boolean checks. You can request different reports with granular filters. Cons: I wish the engine was better able to filter out spam sites or at least provide some sort of filter to take these out. Also would be great if there was more data about the influencer score of the source where the mention happened + more sources. Pros: I like Awario because it lets me know what's happening on Twitter without me having to do searches myself. It also lets me reply or get involved in conversations easily. Cons: This may be an option I'm not aware of, but I wish I could reply to messages without going to the Twitter website. Perhaps a built-in way to do this via the API or selecting a Twitter app I already have on my computer? Overall: Great way to keep up with social media. I'm very lucky to find Awario , because it literally saved my work! Pros: Among other similar tools I'd like to stress such advanced features as Boolean Search and Sentiment analysis. With this app I can find exactly what I need and participate in discussions directly from it. Overall: Price, features, customer service and it saves my time. Pros: This application is the best tool for tracking keywords in social media posts. It enables you to setup any alert easily and get a solid knowledge about mentions directly in your email. Got this software as a Lifetime Deal, I love the daily email. Pros: This software tracks for keywords you specify on social media and the Internet at large. It can be very useful if you need to monitor your brand. Cons: The crawler doesn't seem to cover all the corners of the Internet just yet, but I can see that it's improving. Overall: Passively monitoring for mentions of my brands on the Internet. Pros: Very necessary tool to keep yourself updated about any mention of your name or your company on the entire internet. You can even spy your competitors and see every time they post or someone mentions their name. Pros: Awario has given me the power to know exactly what people are talking about me on the whole web. The part which I love about this software is you get instant notifications real-time whenever someone talks about your keywords in Awario. You can add multiple keywords to track. Cons: I'm limited to 100k mentions a month which sometimes I feel is a little less. However, most of the times it works like a charm so nothing to worry here. 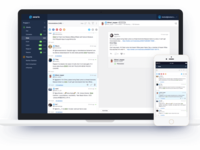 Pros: Awario is a powerful social media and web monitoring service that keeps things simple. I love how easy it is to set up alerts then just have them delivered to my inbox. Cons: Nothing. Awario delivers no matter how small the niche category. Pros: The way it is organised and the detailed reports produced divide by allerts or alert groups. Cons: The accuracy of the software and the bolean search by a non dev perspective. Overall: Overall experience is good, but in my language doesnt find a lot of results or as much as I expected. Very good for youtube and twitter. Not so good for web and facebook. Pros: Very user-friendly. Alerts right away it finds your keyword and lets you interact with the publisher. Cons: Sometimes it doesn't refresh automatically and you have to do it by yourself. You cant go the exact tweet outside the app. Great social listening tool, does not provide anything extra than the other social listening tools. Pros: I like that it's a clean and easy to use interface. In addition to that, the app is fast and intuitive. It provides you all of the necessary social listening and monitoring tools. Cons: Not much in the software that can't be done with other listening and mention platforms. I can't say I see the monetary value in the platform that makes it unique from the others. It is a good platform, but it's just not something outstanding quite yet. I know the road map features are coming though. Overall: Social listening and monitoring of specific terms, keywords or mentions we wanted to track. Awario is young but is powerful and gains strength constantly! Pros: Awario offers a calming environment for a software like this. That might seem like an odd comment but competitor software can often be quite frantic and a little bit...everywhere. It's quite easy to follow, add alerts to and offers very good results. The graphs are also beautiful and VERY presentable! Cons: It does miss some results I've found but the algorithm is being perfected constantly. It can look a little dated in places too, but it does it's job and does it well! Pros: What I like about Awario was how everything was presented. It was easy to see where people were talking about my products/brands, without me having to create a bunch of filters and connect to a bunch of platforms. It's really clean and I can quickly show stakesholders in my company what's happening. Overall: Knowing where people are talking about my company's products allows us to also monitor if there's support issues that we are unaware of, as well as potential opportunities to do more conversations. Pros: I like so much that the app it's very easy to use. I see so much value in their deeper analysis for Social Media, everything in one place. Great to set alerts and create reports. Cons: I don't like that my first time using it, I needed few hours to see deeper results. After that it works great and very fast. Overall: I use Awario to have a global view of my business brand in seconds. The app has a great value for companies and entrepreneurs. I've moved from Hootsuite to Awario. Pros: Awario is a good social monitor for bussiness or brand. Cons: Awario is not really good on picking mention on the web on general. I use other app and get better result for picking links or mention on magazines, blog, forums or other media. So if u wanna track new link or mention outside of social media awario isnt for your. Also not very good for instragram or other socialmedia like youtube. Overall: I monitor social media, mostly twitter. Bad customer service, not recommended. Pros: Decent functionality, but not truly useful, at least at the level I have access to as a professional user. Cons: Lack of delivering on the service level that was promised. Confrontational and unhelpful customer service. Overall: Decent idea, but due to lack of vision, seems like they are not in business for the long haul. Would go with other competitors who are more interested in growing features and delivering a great service. Pros: I've set Awario up once and now I can relax knowing that my daily emails will keep me posted on important mentions. Cons: I can't think of anything I don't like about Awario! Overall: Awario is simple to use but offers an extensive service. Customer support is prompt, efficient and super helpful. I would highly recommend! Pros: I don't have to pay anyone to find stuff in mentioned in so i can respond. If it works right, it's a big time saver. Cons: It doesn't always find everything, a d there are plenty of false alerts. Things like that can waste time.